There's been a little bit of progress here and there. I've connected the DC/DC converter to the 12 volt system and succesfully too. The little voltmeter that plugs into the cigarette lighter outlet now shows 13.5 volts when I have power on. 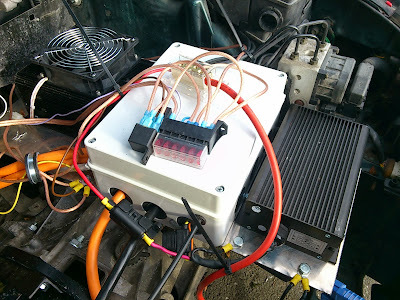 The converter was drawing about an amp when just charging the auxiliary lead acid battery, but with all lights on the current draw jumped to about 5 A.
I've also mounted the Cycle Analyst display in the dashboard. It's blocking the view to the tachometer and fual gauge, but they're not working anyway. Also it blocks the bright out-of-gas light as well, which was rather intentional. It does not block the speedometer or any other useful signals though. 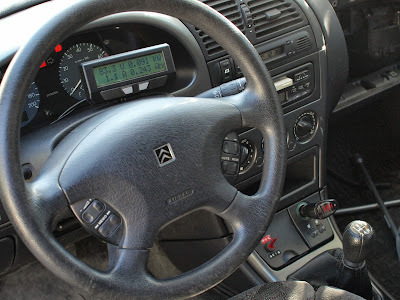 In addition to the Cycle Analyst you can see a red flip switch in front of the gear stick. It has two positions. Forward or "AJO" activates the main contactor (provided that the car is turned on using the original key) and lights the switch red, albeit dimly. Flip towards the rear of the car or "SEIS", the main contactor deactivates and the car will not move by it's own power. Should be pretty easy to do that even in an emergency. Also you can always switch to neutral by hand, which should be doable even without the clutch. I was also looking into some heat. I dismantled a 1000 W 230 VAC cabin heater that I got for 9,99€, but unfortunately the PTC heating element inside didn't put out any useful amount of heat at 80 VDC. Also it was quite small and pushing all the air though that small element would have been less than ideal. I did figure out a place to put it in though. There's a pollen filter that's easily accessible that I think I might be able to adapt to hold whatever workable heating element I can get my hands on. I have been talking to the local vehicle inspector about the UNECE R100 rule, also known in Finland as the "E100-sääntö". I thought it would help fellow converters in Finland to share what I've discovered. As you may or may not be aware, the R100 is required from all conversions done in Finland. The local inspector whoever doesn't know anything about electrics, so what you need to have is someone with the proper qualifications to check the vehicle. The next question is which version of R100 do you need to follow. The answer depends. Any vehicle must adhere to a version. Even if it's 1961 VW Beetle, you have to pick one to follow. There wasn't a R100 paper then, but nevertheless you need to follow one. For a 1997 vehicle like mine you could go with the version that was in effect at the time of the first registration of the vehicle. That would to my knowledge be the 1995 version. However I can't find a version of it in finnish and the 2002 version, strangely published in 2009, seems to have pretty much the same text. So I'll probably go with that. You can always use a newer version. What you don't want to do is pick the fresh August 2013 version. It seems to have some horrible requirements for the battery box construction, testing and so forth. Just goes to show that the OEMs are really trying to do everything in their power to stop people from building their own EVs. All of this of course only applies to M and N class vehicles, or cars and vans. Motorcycles have no such requirements as far as I know. Unless of course they're new enough to require EMC testing. ps. I've prepared a document with checkboxes to give to the electrician. It's in finnish. If you'd like a copy, throw me an email. The address is at the top the blog. It is still untested however. I had a little bit of the good old back and forth fun with the car last week. 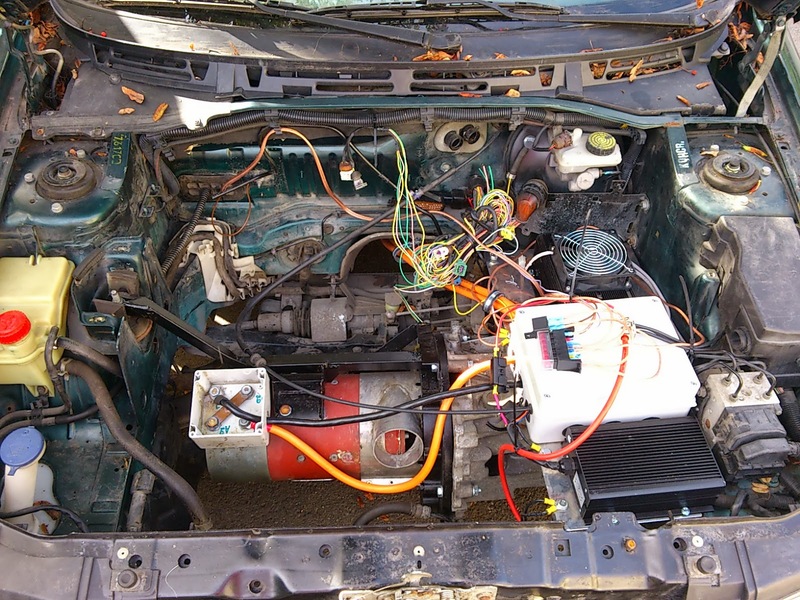 That's to say I got the 12 volt systems wired up as well so I could jump in the car, turn the key, flip a switch and press the acceleration pedal. Not just that, but even make the car move by doing so. And move it did. Shamefully I have zero photographic or video evidence of this event, unless you count this picture which shows that the vehicle has indeed turned around. 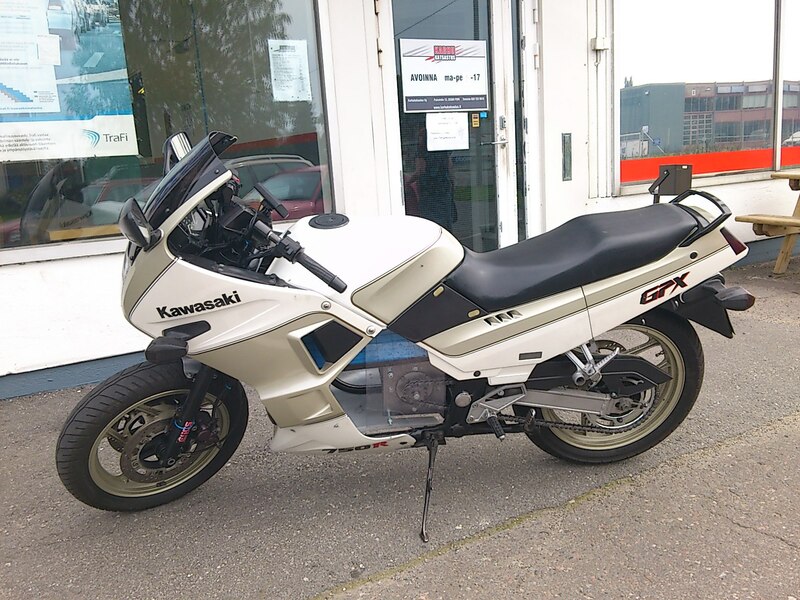 I tried third and fourth gears which both seemed fine for taking off. No clutch required, or available, for that matter. Reverse gear was a little bit more problematic. Too much power available resulting in jerky movement unless pressing the pedal extremely gently and letting go at least as gently. Probably this jerkiness was what bent my support structure too. Oh well. At least my welds were stronger than the thick angle iron! That's worth something, I suppose. Also goes to show much power a small 8" electric motor has. 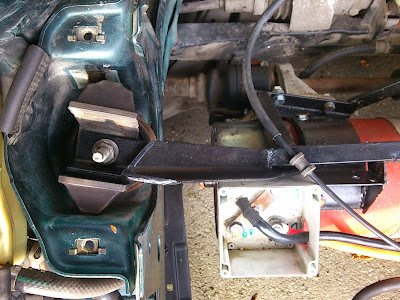 It's also quite amazing how simple my 12 volt electrics are. 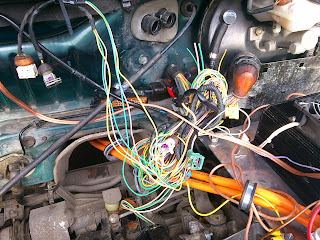 Especially compared to the complicated original wiring of the petrol engine. I have most of the original wire bundle ziptied in place just to get the three wires that are required for the speedometer to work. Perhaps I will remove more of the extra wiring later. 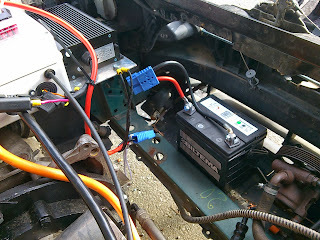 All the new electric car wiring is on top of the case which houses all the high voltage wiring and the 0-5k throttle. Just a few fuses and a single relay so far. I've also been talking to the authorities and my plans for power brakes and steering seem solid. I'll need to implement more heat that I'll ever need, but I think I'll figure that out as well. For the UNECE R100 regulation the final word is that I'll need to have my wirings checked by a certified professional and get a paper for it. That should be enough for the "MOT" check. Sounds reasonable to me. Aux battery still needs to be secured in place. Needs a bit of tidying up. The mess of original wiring. Actually in use: 3 leads. This post is in finnish, mainly for the readers of my writing in the local WattiViesti magazine. Muutama lukija on ottanut yhteyttä WattiViesti-juttuni johdosta. On kyselty mm. mistä käytettyjä komponentteja mahtaisi saada. 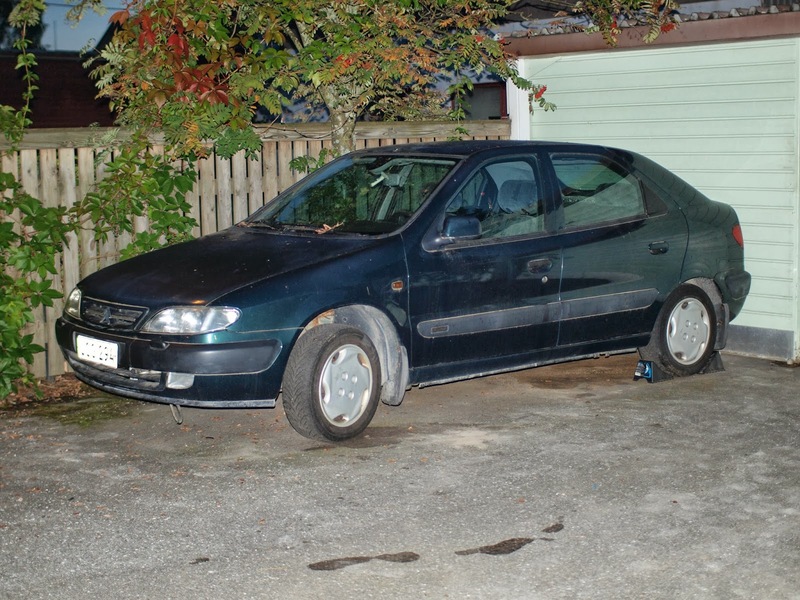 Omat moottorini löysin Sähköautot - Nyt! -sivuston foorumin ilmoituspalstan kautta. Valitettavasti käytettyjä komponentteja on Suomessa liikkeellä mielestäni varsin harvoin. Toisaalta kerran hankitut omat komponentit on mahdollista kierrättää ajoneuvosta toiseen. Eri asia sitten on, kauanko Trafi suvaitsee hyväksyä mitään muutoksia. Suunta ei ole ainakaan parempaan päin. Syytä toki pitää etsiä myös kauempaa sekä paikallisesta lainsäädännöstä että EU-tasolta. Toinen kyselty asia on sähkömoottoreiden teho. Jotain osviittaa käytettyjen moottoreiden tehoista saa esimerkiksi katsomalla Kostovin moottoreiden vertailua. Sähkömoottori kuitenkin eroaa polttomoottoreista samaan tapaan kuin esim. Diesel-moottori eroaa bensamoottorista, mutta vielä radikaalimmin. Tehohuippua ei esimerkiksi ole vaan moottorin täysi vääntö on käytettävissä heti kierrokselta nolla. Muunnetulla sähköautolla voi täten lähteä liikkeelle paikaltaan ilman kytkintä esimerkiksi jopa 3- tai 4-vaihteella. Oma kWsara-projektini ainakin näyttää kotipihassa liikkuvan näillä vaihteilla ihan hyvin. Peruutusvaihteen välitys on turhankin tiheä ja auto tahtoo singahtaa taaksepäin. Moottorin lisäksi tehoon vaikuttaa toki myös käytetty ohjain ja akusto. Omaan autooni tuleva ohjain toimii 120 volttiin ja 600 ampeeriin asti, joten sen laskennallinen huipputeho on 72 kW. Todellinen mitattu teho voi sitten olla jotain ihan muuta ja tuo vääntökäyrän erilaisuus kannattaa edelleen pitää mielessä. Sähkömoottorin vääntö kun on tasainen aina sen huippukierroksille asti, jonka jälkeen vääntö alkaa loivasti laskea. Näiden asioiden lisäksi akuston tulee myös pystyä antamaan riittävä määrä ampeereja ja voltteja "kyykähtämättä". Teho on siis sähköautossakin monen tekijän summa. Voin listata käyttämieni komponenttien hankintapaikkoja sitten kun olen varmistanut, että niillä todella pääsee muutoskatsastuksesta läpi eikä Trafi ala vaatia jotain sellaista, jota heidän ei mielestäni pitäisi.